Casino Luck is making sure that all of its members have a Christmas week to remember with some fantastic promotions. The casino has been offering various bonuses since last week but there is still time to enjoy the remaining offers. Today if you deposit at least £20 at the casino you will receive 50 free spins on Lights slot which offers the chance to make some fantastic winnings. Then on Wednesday, Thursday and Friday if you use the deposit code ‘CLSANTA’ when making a deposit you will receive a 100% bonus of up to £50. Thanks to these great promotions you can be sure of having a fantastic Christmas and with a bit of luck the bonuses will lead to even more winnings. 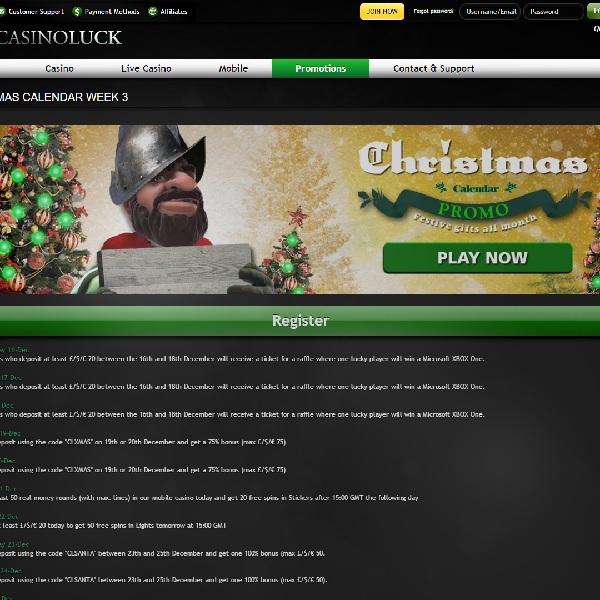 Head over to Casino Luck today and see if you can guarantee yourself a very merry Christmas.